Born and raised in Southern California, Mark’s interest in aviation began at a very early age. Learning to fly while still in High School at the age of 17, his career has spanned 42 plus years in the Flight Training, Regional Airline, Corporate, Major Airline and Charter fields. He has had the privilege of flying corporate VIP’s, Hollywood elite, Sports stars, Foreign Dignitaries, US Senators and a former President of the United States. He has participated in Search and Rescue operations and flying helicopter support in the aftermath of Hurricane Katrina. Mark holds an Airline Transport Pilot certificate in Single and Multiengine Aircraft and Rotorcraft-Helicopter with over 25,000 accident, incident and violation free hours. 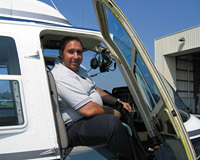 His experience includes on-demand Charter, Executive transportation, Search and Rescue and Electronic News Gathering.